Most often, the bottom-line reason people find their way to my psychotherapy practice is because of relationship issues — struggling marriages, unsuccessful dating, lousy relationships with family and/or coworkers — and of course, their relationships with themselves are also frequently out of whack. Much of this shows up as depression and anxiety. Rest assured that all of them can read very, very well. I work in Washington, DC, not far from the White House, and none of the patients I see are wanting for intellectual development; almost all of them are highly educated and exceptionally successful in their careers. It’s the “other stuff” of life that eludes them — loving and being loved, balancing their lives, managing their emotions, living a life of meaning and depth. Almost without exception, their early experiences of connection with their parents — their attachment — looms large in how they got here. What does this have to do with babies and reading, and those horrendous advertisements for teaching your baby to read? First and foremost: The fundamental task of early childhood isn’t learning to read, or to “get ahead” for school, or to impress the neighbors, or to give the folks something to brag about. Encouraging children to surge ahead beyond their real developmental needs leaves them with some really sludgy clean-up to grapple with later on. The most important task of early childhood is experiencing a healthy, secure attachment in which the child’s caregivers are attuned to the child’s inner state and respond in a contingent manner. Let me say that again. What kids need from the get-go is a parent who “gets” them, who pays attention to what’s going on inside them, and who responds to them in a way that’s actually related to what the kid is feeling. Healthy, secure, attuned attachment gives kids some much deeper “advantages” in life than whether they learn to read early (and learning to read early doesn’t actually give them any advantages, anyway – which I’ll get to in section II below). “Well,” a parent (or a video marketer) might say, “letting a baby or a toddler watch an educational video to help them read earlier won’t interfere with healthy attachment.” Actually, it can. As a psychologist/neuropsychologist who has been practicing psychotherapy and conducting cognitive evaluations for nearly twenty years, as well as having researched the relationship between brain and behavior in both infants and adults — I believe that using television to “teach” young children is a big mistake, with significant costs down the road. What’s the message when (by offering your child a mesmerizing “educational” DVD, and also showing them your pleasure at their achievements) you emphasize the value of learning to read extra early, over time spent with siblings, parents, or friends? What might your child be learning from developing the habit of spending time in front of a “worthwhile” or “engaging” video, rather than with someone who loves him or her? What are you telling your child when you’re putting them in front of the TV instead of showing them that you value interacting with them and want to be with them? How does it help a child to see a screen as their teacher, rather than a real person — what do they do when they have a problem they need to solve, and they don’t have the early, repeated experiences of asking an adult to help them? I understand that parents are overworked, and stressed, and sometimes feel the need to use the television as a babysitter. Maybe they themselves don’t have enough of a repertoire for unwinding or taking care of themselves beyond watching TV (or other types of screen time). Maybe they also have some leftovers from their own childhoods, about how they were or weren’t connected to their parents in ways that allowed them the dozen benefits listed above. (Regular readers of this blog will know that it’s not too late for those parents to rewire their brains and get those kinds of benefits for themselves — and for those of you who are new here, I hope you’ll take a look at some of my other posts to learn more.) And another thing: Early reading doesn’t do much for your child’s success in school, and there’s evidence that it may even be detrimental. Let’s take a look at a few points in that regard – and note that this list is only a few of many reasons why early reading is a lousy deal for your child. Louise Bates Ames, PhD, a superstar in child development and the director of research at the world-renowned Gesell Institute of Child Development, stated that “a delay in reading instruction would be a preventative measure in avoiding nearly all reading failure.” Leapfrogging necessary cognitive developmental skills — and asking a young brain to do tasks for which it isn’t truly ready — is asking for trouble with learning. The brains of young children aren’t yet developed enough to read without it costing them in the organization and “wiring” of their brain. The areas involved in language and reading aren’t fully online — and aren’t connected — until age seven or eight. If we’re teaching children to do tasks which their brains are not yet developed to do via the “normal” (and most efficient) pathways, the brain will stumble upon other, less efficient ways to accomplish the tasks — which lays down wiring in some funky ways — and can lead to later learning disabilities, including visual-processing deficits. 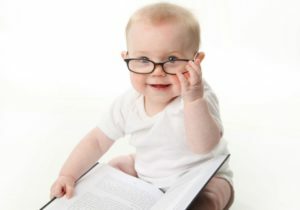 The description of brain development on which the “Your Baby Can Read” program rests its questionable claims is remarkably flawed, confusing language acquisition with reading. They state: “A baby’s brain thrives on stimulation and develops at a phenomenal pace…nearly 90% during the first five years of life! The best and easiest time to learn a language is during the infant and toddler years, when the brain is creating thousands of synapses every second — allowing a child to learn both the written word and spoken word simultaneously, and with much more ease….” There is a huge and unsupported leap here from language acquisition – which is definitely an important developmental task, necessary for connecting to one’s outer world – and reading, which is a very different neurological and cognitive task, and one which is not developmentally appropriate for a baby or toddler’s brain. Does early training really get you anywhere? There is a classic study of twins which was done by another pioneer in child development, Arnold Gesell, PhD, MD. He studied a pair of toddler twins, who were not yet able to climb stairs. For the study, one of the twins was given daily practice and encouragement to climb stairs, and the other twin had no stairs to practice on. After six weeks of practice, the “trained” twin could climb the stairs, and the “untrained” twin could not. However, within one week of being given the opportunity to climb stairs, the untrained twin completely caught up with the trained twin’s stair-climbing ability. The whole idea that learning to read early gives children — or our educational system, or our economy — an “advantage” is not based on empirical evidence. If you look at the US and Britain, you see the trends toward earlier reading and increasingly less successful educational systems. On the other hand, the majority of children in Finland begin instruction in reading at age seven — two years later than here in the US (and even later than the folks at “Your Baby Can Read” would have you start). The outcome? Finnish students not only catch up to their earlier-starting counterparts, but they surpass the United States, other European countries, and Asian countries as well, with top overall scores in the world in reading, science, and math. Oh, and the Finnish do attend preschool, but it isn’t “academic” in nature — it emphasizes social development and exploration. If you want your child to be wired for success in life — whether you measure that by academic and career achievement, leading a meaningful life, contributing to the world, or being an adult who creates loving, healthy relationships with others — give them the gift of healthy, attuned attachment. Let your child know that who they are matters to you more than how well they perform in school. Give them your time and attention. Bottom line: If you want to give your children an advantage in life, tune in to them.